If you're on the hunt for a top-notch 5th Wheel that's built for the long haul, then look no further! The reliable 2019 Keystone Cougar Half Ton 25RES is perfect for you and your family! 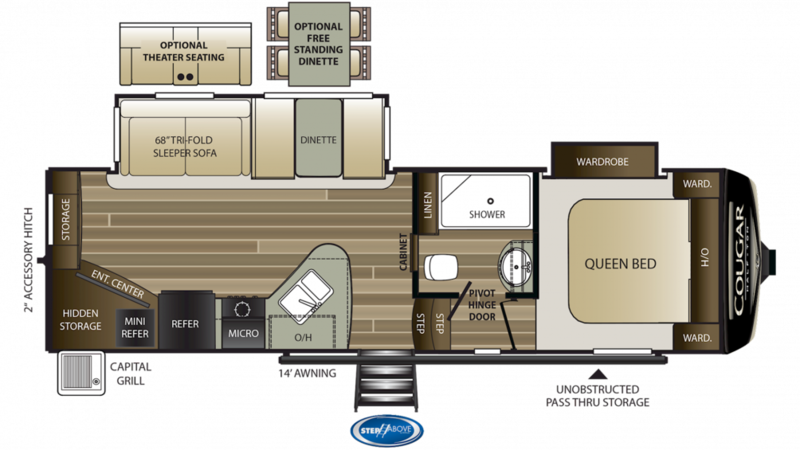 This model is available now at Lakeshore RV Center, located in beautiful Muskegon! We offer our models at factory direct prices, ensuring that you'll find the nation's lowest prices on top quality RVs! It's just one of the reasons why we're the number one RV dealer in Michigan and in the nation! Stop by our site at 4500 E Apple Ave Muskegon Michigan 49442 and you'll bring home your dream RV at a dream price! If you would like to talk to one of our Cougar Half Ton experts, call us now at 231-788-2040! You can lounge outside under the shade and protection of the 14' 0" awning! This rig has a GVWR of 10000 lbs, as well as a hitch weight of 1500 lbs, and a ship weight of 7500 lbs! The interior of this 5th Wheel is stunning. There's ample headroom because the interior is 11' 8" tall and it's a roomy 8' 0" wide. You'll have plenty of space for indoor living when the weather isn't accommodating. If it's hot, you'll stay cool with the 15000 BTU air conditioner, or cozy and warm with the heat from the 35000 BTU furnace. You and your family will enjoy comfort and ease on the road in the spacious 2019 Cougar Half Ton 25RES! It's 29' 7" long, 8' 0" wide, and has 2 slides that maximize the interior living space! And regardless of the weather outside, you'll keep the climate inside cozy and comfortable thanks to the efficient 15000 BTU a/c unit and the efficient 35000 BTU furnace! In addition to the comfy living space in this 5th Wheel, the kitchen comes with a 3 burner cooktop for meal prep, and a 8.00 cubic foot refrigerator so you can keep fresh food and condiments handy! The 60 gallon fresh water tank provides plenty of fresh water! Enjoy the privacy of your own Foot Flush toilet and shower inside the bathroom! With 60 lbs. of LP tank capacity, your morning showers won't go cold! There's both a 60 gallon gray water tank and a 30 gallon black water tank, so you won't need to look at or smell your dirty water and waste while on vacation! Whip up your favorite meals out in the fresh air! The outdoor kitchen makes summer cookouts and tailgating fun and easy!